WOW. Just wow! VFC continues to blow my mind with their amazing, high-quality Airsoft guns. ActionSportGames (ASG) intelligently chose to partner with Vega Force Company (VFC) to produce an Airsoft Replica of the Ashbury International APO Asymetric Warrior (ASW) .338 Lapua Sniper Rifle. After getting a fairly in-depth look at the ASG product line featured at their Shot Show 2012 Airsoft booth, I gotta say that ASG, while relatively unheard of in the U.S. MilSim market, should most definitely be placed on your "Airsoft Companies to Look Out for in 2012." I would expect these guys to become very popular in our market this year with options like this and the CZ Scorpion Evo 3 A1, scheduled for release at the end of this year. Here's a couple specs on the ASG Ashbury Internation APO ASW338 LM Airsoft Sniper Rifle for your viewing pleasure. - Unique BB loading system allows correct positiong of magainz ewell, which adds realism when operating the rifle. - VSR10 compatible internal parts, including ability to upgrade to Laylax Zero Trigger system. - Optional upgrade kit will allow use of up to an M150 spring to get you in the neighborhood of around 550 FPS w/.20g BB. This is the manufacturer's rating, however. I know that there are some pretty innovative Airsoft technicians out there who could quite possibly push the limit well beyond that. Especially if they build the internal infrastructure as solidly as they did the exterior. I wasn't kidding in the video when I estimated the gun to be around 10 lbs. 'TWAS A BEAST!!! Come to find out, ASG is rating the weight at an estimated 6 kilograms (kg), which translates to just over 13 POUNDS!!! Bring your man card when playing with this gun. Some users may find the weight deterring, but some, like myself, just might not care so much. - Gas piston internal system is currently under development, but after speaking with one of ASG's chief designers at the booth, it didn't sound like we will be seeing that this year. He also indicated that current plans are for a gas-in-bolt system, but I did make sure to inform him to do some more research on the various major Airsoft forums out there about that, because I have read reports and spoken with several end-users about their experiences with their gas-in-bolt systems (e.g. SOCOM Gear Cheytac M200 Intervention Airsoft Sniper Rifle). The common consensus is that gas-in-bolt systems are not the preferred setup by the players who would spend the kind of money this gun is going to cost (sorry, Bargain Bin Boys, I seriously doubt this guy will show up on the market for less than $300). I gave the ASG the example of Tanaka & KJW M700 series Airsoft Sniper Rifles, which feature gas-in-magazine systems that are perhaps some of the most widely popular platforms in the serious MilSim gas sniper market. It would also allow the High-Pressure Air (HPA) enthusiasts to adapt the system for that as well, since it performs so well in a wider range of temperature conditions. If, after checking out my latest entry here on the Pyramyd Airsoft Blog, you find yourself in extreme desire to purchase this weapon upon its initial release date, I would highly suggest contacting Pyramyd Air ASAP and letting them know you need this gun and you need it NOW!!! Pretty sure they can help you out. 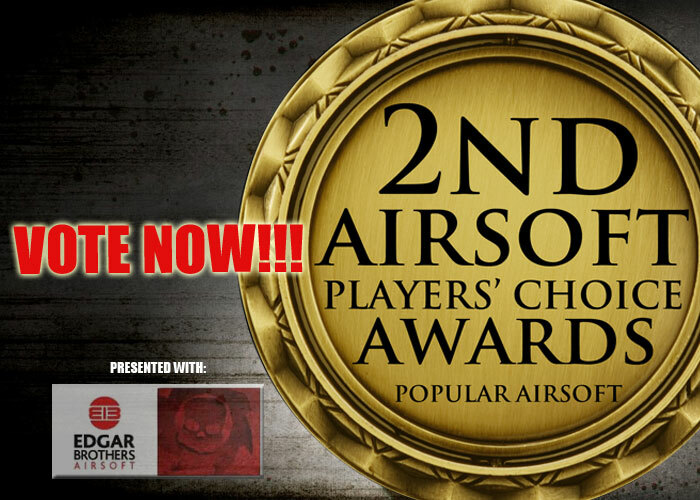 Last, but not least, this is the final week of voting for the 2nd Annual Airsoft Players' Choice Awards, hosted by PopularAirsoft.com. 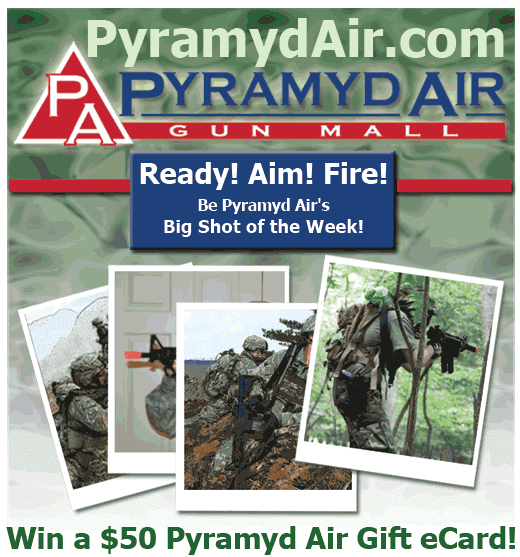 If you've enjoyed the content that I've posted here on the Pyramyd Airsoft Blog, please do me the most hugest of all ginormous favors and select the "Pyramyd Airsoft Blog" as the "Best Airsoft Blog" of 2011 (Found in Section #8 on the voting page). Click the link below to be taken directly to the page where you can place your votes.